Michel Bosc is a fan of the Malory Towers series (Malory School in French). He knows all the characters of the series so well, as if they belonged to his family. With that privelidge, I requested him to write an article about a subject which can only inspire it. You can now enjoy reading his fine analysis of the girls of "Malory Towers". a series for children ? Yes, the Malory Towers series is certainly meant for young people, as the kids' tricks which fill the pages of the different books and the ones in which the form mistresses take part, make reading these stories fun. Mid-night parties, little greedy girls, runaways, jokes, in short, all the ingredients that you find in the Famous Five series are also present here. For all that, Enid Blyton has never really dissected to the minutest detail the human character. Not without reason : the heroine of the series, Darrell Rivers (Dolly Rivers, in the French series), is itself nothing but a reflection of Enid Blyton herself (let us not forget that her second husband's name was Darrell Waters !). In many ways, Malory Towers, which includes more than some hundred characters, is a social and realistic, often very dark fresco : children's literature does not necessarily mean sweet literature. Quite naturally, we come across, in this boarding population, a wide range of human qualities, both positive and negative, such as Darrell's quick temper, Mary-Lou's shyness, the rough Alicia. For all that, it is never just a mere question of allegories or same prototypes. Enid Blyton so cleverly paints a picture (ugly for some, pretty of others !) of the various girls whom we meet : Priscilla's purely physical narcissism is not deceitful vanity, or Gwendoline's cowardice. Different characters constantly keep interacting and evolving, thereby enabling infinite psychological sometimes complex situations. If, in the Famous Five, time does not really seem to be actually present over the protagonists who are similar in every volume, it is on the contrary omnipresent at Malory Towers whose girls it models, in such a way that by the time the reader comes to the end of the story, he really feels as if a whole term has ended. Alicia, in whom we see a real friend of Darrell, disappoints us ; Sally, who seems to be quite a nuisance at the beginning of the series, becomes one of the strongest friends ever. Ellen, who is first to blame, is later, felt sorry for. Mary-Lou, who is funny at first, asserts herself gradually. Gwendoline herself will find (justly, it is true !) redemption. The most exciting time during the term comes when the girls have to do a theatrical drama. Darrell Rivers (still a projection of Enid Blyton) is the play writer, Sylvia singer, Belinda painter, Irene musician. The naughty Alicia is reduced to play the role of the clown ; often presented like a little girl, Mary-Lou, hatches out her feminine character, by playing the role of Cinderella, while Alex, a tomboy, is the prince. You can see that in the original French editions of the series, Josette Robion's illustrations (in the first five titles) did far better justice to giving a deep effect to the various characters compared to Patrice Harispe's, who gives a childish look to the girls in the six and last book. Yet another thing one can notice at Malory Towers is that it is the scene of continuous dominations, which is itself one of the main themes of the term cycle. Dominating, but efficient, Belinda	crushes Jill. Same between Corinne who dominates her twin sister Kate. Thanks to her shrewdness of lying, Dany takes Gwendoline, treating her by her weak point : vanity. Myra receives anonymous letters thus giving away her authoritarianism, and Darrel herself is called a tyran. Authority is also being treated by teachers, whose head-mistress, the imposing Miss Grayling, cristalizes all stature. 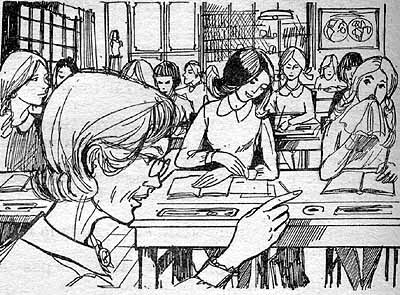 The difficult syllabus that the students at Malory Towers have to follow weighs heavily down upon them throughout the term. Turning point towards adulthood, the school changes its girls to young perfect ones. They have to put up with a lot of suffering : the programmes are filled, many of the girls find it hard to cope with them ; sports are cumpolsory... iron discipline. In such a tough setting, jokes and tricks do their bit of letting the steam out of the students. 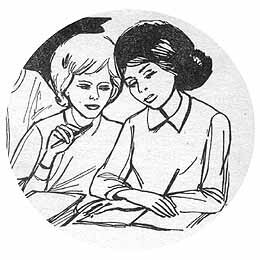 The theme of being authoritative is also evoked through the role of the class monitor that the other girls find it hard to obey. So, is Malory Towers a prison or an Alladin cave ? With its four towers and the uniform that the girls are made to wear, it ressembles rather like a forteress cut off from the rest of the world. And, curiously, the main concern of the pupils is to escape from it, at least, for some time, even if the holidays seem to be too long and the students really seem to miss Malory Towers during holiday time ! Yet from Lisa and Phyliss' running-off to Mary-Lou's fall down the cliff, to the songs that Sylvia practises in the middle of the night, to Alex's prouess with her horses, all the "girls of Malory Towers" seem to want to get out of its walls. Malory Towers is also a metaphysic fable, in which each one has to fight against her share of difficulties. In this dreary fight, it is not always the good that wins over the evil. Darrell, who is going to be the first victim, only knows too well that her dreadful temper will spoil things for her. Doesn't she squash Edith, slap Gwendoline or push Muriel ? It is while yielding to such weaknesses that she loses her position of monitor, consecration of authority in this hard disciplined school. Many other characters are fighting against themselves : Irene suffers from carelessness, which stresses her and makes her lose her time. Priscilla wants to be like others in her form, without actually knowing how to go about it. Gwendoline, who is unable to gel herself with the others, keeps cheating in order to attract attention upon herself, and earn respect from the best pupils. 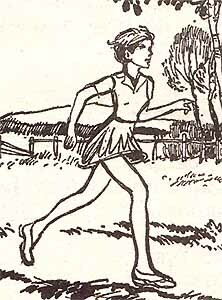 In her best-ever school series, Enid Blyton manipulates with dexterity extremely difficult subjects : jealousy between sisters, lonliness (Edith), robbery (Dany), illness, cheating in the exams (Muriel), cruelty (Corinne, Gwendoline), anonymous letters (June). One of the most frequently declined themes in this cycle is lies, studied under various forms : some lie because they take a pride in doing so, others in order to better hide their faults, certain others out of cowardice. Academic failure is regarded under different aspects : Gwendoline's insufficient education, Priscilla's cultural background, Muriel's illness, Sally's psychological problems, G�raldine's brains. In Malory Towers' cycle, the pupils' problems are evoked to the tiniest detail whereas the world of grown-ups seems to be vague, faraway, and not in the least bit correct. Teachers, and form-mistresses inspire a rather distant respect or resume themselves to being caricatures, without managing to attain reality of the students : the narrator situating himself at their level, this barrier makes the story more credible and dramatically more efficient. The reader, immersed as he is among the pupils, will find himself led to share in their point of view, is necessarily more closer to it. Yes, Malory Towers is well and truly a series for children, but has nothing really sweet. The excitement does not come down at any time all through the six volumes, and only, the term-end puts an end to it. You are surprised at dreaming about what would have been a continuation, thereby evoking the adult life of the "girls at Malory Towers", but "that is another story ! ".